1. Choose your colour paint you want to use on your fabric. You can choose any amount of colours, depending on what design you are going to make. 2. Take your buttons and glue onto your wood block. You can glue the buttons according to the pattern you want to create. 3. 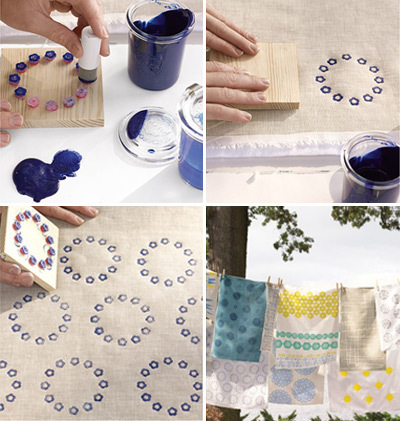 Set your fabric or material flat out onto a table. 4. Take your paint and paintbrush, lightly paint over the top of the buttons. Do not let the paint run over the buttons. 5. Then take your wood block and press it onto your fabric, creating your pattern. You can do this as much times as you like till you have your desired pattern. Once completed allow the fabric to dry. What you need: buttons, wood block, paint of your choice, fabric, paintbrush, glue.